This month, I’m thinking about composition of numbers and arithmetic. I went to my 4th grade daughter’s curriculum night last night and heard an excellent explanation for the controversial Common Core State Standards for Mathematics. The teacher told the parents, “The Common Core figured out what successful students were doing and decided that ALL the students should learn how to use those strategies to be successful.” As an example, she said that if she asked us “What is 9+6?” many of us know it is 15 because we automatically think “10+5.” We make the shift in our heads to make an easier problem, or we made that shift enough when we were learning our facts, that we can instantly recall the answer now. 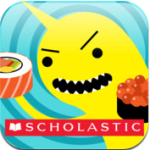 Two of my favorite apps (and also favorites of my own 4th and 1st grade children) are Sushi Monster (free at the App Store) and Sums Stacker ($1.99 at iTunes App Store). Both apps allow the user to practice math facts, but at the same time build understanding of numbers through composition. 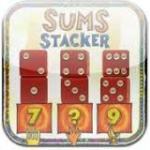 Sums Stacker provides the option to build numbers using dots on dice, numerals, and words. Multiple representations allow teachers to direct practice toward students’ strengths and needs, and help students make critical connections. When students understand what they are doing, rather than simply memorizing number combinations, they learn facts and can use them more creatively and flexibly for problem solving. In their book Learning and Teaching Early Math: The Learning Trajectories Approach, Douglas Clements and Julie Sarama describe the learning trajectory for composition of numbers. BEFORE understanding that a sum is the total of values, young learners go through a progression of understanding. First they must understand the concept of parts and wholes (although they may not yet understand that the groups are the smaller groups added together), know that the whole is bigger than the parts, and are able to name the parts of the whole. After these understandings are in place, typically by around age 5 (but this may vary depending on the abilities of the child), the learner begins to compose numbers up to 7, then to 10, then using tens and ones, and so on. For learners who lack an understanding of the operations, asking them to learn math facts is really asking them to learn random number combinations, for example, 7, 8, and 15 go together. If they lack understanding that smaller parts make up a whole, 7+8=15 will never be more than 7, 8, 15. Technology tools like Sums Stacker and Sushi Monster reinforce this idea of composition of numbers in the context of arithmetic. They are engaging, meaningful methods for practice, but they are only tools. We do not just need our students to memorize facts. We need students to understand what the facts mean, what they are doing when they are computing, and how to use that understanding for problem solving and developing flexible thinking. Kate Fanelli is the math accessibility specialist for Michigan’s Integrated Mathematics Initiative (Mi)2, a state initiative that promotes and supports high quality mathematics education for ALL students. Follow (Mi)2 on Facebook (www.facebook.com/mi2.page) or on Twitter (MI2_Math). Contact Kate at kate.fanelli@misquared.org. Tagged games for learning, iPad apps, MathTech, Sums Stacker, Sushi Monster. Bookmark the permalink.